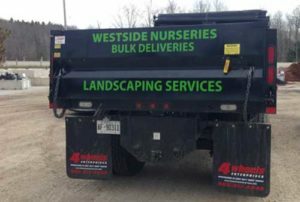 Deliveries & Plantings | Westside Nurseries & Greenhouses Ltd.
We are able to deliver material to you for a nominal charge, which is determined based on location. Deliveries are completed on a first come, first serve basis. All of our bulk material is sold by the cubic yard, with a half cubic yard available as well. We are able to do plantings for any trees or shrubs purchased through us. Whether it is a large wire basket burlapped root ball tree, small shrub, or annual planter – we can do it all! Our planting service includes the necessary requirements of 7″ metal stakes to anchor trees ensuring straight growth, and special fertilizer to aid in the development of a strong root system. Contact us for more information and details pertaining to the capabilities of our trucks and equipment.